The Most Powerful Magic of All: A Retrospective Look at Season 4 of My Little Pony: Friendship is Magic (Part 1) | The Reviewers Unite! A look back at the latest helping of ponies. I’ve avoided jumping into the fray of the so-called Brony Reviewer/Analyst circle mostly due to time constraints and other priorities, so I knew that if I started down that path, I would’ve created some kind of commitment that I just couldn’t keep up with. Still, I’ve been planning on saying something regarding Season 4 of My Little Pony: Friendship is Magic in some capacity, so here’s an overview of some of the major aspects regarding the show these lasts few months, from the point of view of its development and its position as one of the bigger, if not the biggest, of Hasbro’s properties at this moment. Let’s just jump right in. It’s safe to say that 2013 was one of the most… what word can I use for “controversial” that won’t sound so overblown? OK, let’s go with “agitated”. 2013 was a very agitated year for MLP and its volatile online fan base, given that we were watching the brand´s current generation go through some growing pains. After FiM proved itself to be a big hit, it was only a matter of time before we would begin to see some changes. 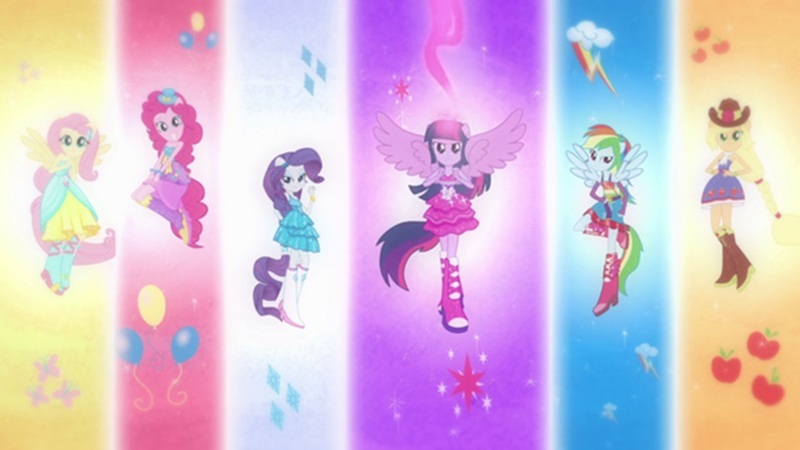 From Princess Twilight to Equestria Girls, the brand was quickly expanding before our eyes. As we all know by now, the result of combining change and the Internet is as if throwing salt on an open wound. 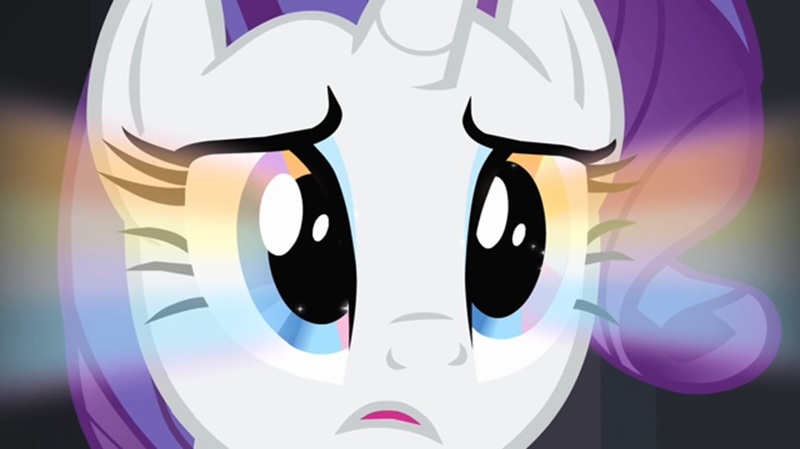 The outcry from all manner of bronies or just fans in general was heard across social networks and message boards all over the Internet, to the point where people who don’t even pay attention to MLP became aware of some of these events. For many, this was a sign of the series’ downfall. 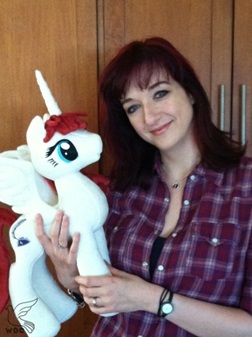 Between this and the departure of show developer/show-runner Lauren Faust (and also story editor Rob Renzetti), many purists and animation buffs began to give up on it, believing that what once was a testament of auteur-driven projects in the medium of animation was now becoming another merchandise-centered production void of any substance. Yes, there were fans who called for reason and wanted to give change a chance, but if the Internet was going to remember 2013 as a landmark moment for the series (beside MLP’s 30th anniversary), it will be the formation of the largest divide between fans yet. The days of the idealized fantasy of bronies being a united force who’d fight battles against the show’s detractors together were becoming ever more distant every day. From misguided passion, vitriol spilled all over the place, and fans severely antagonizing the people left in control of the show’s production (right down to the empty death threats), this was the year in which bronies solidified their position as just another Internet fandom, at least in the broad strokes of the asinine behavior one expects to find within the fandom of X property. Sure, we had an image problem before, but this image of bronies could now also be seen from the inside out. In other words, this was starting to take its toll on other bronies that simply wanted to judge the show and its new twists on their own terms. We’re all mad, even if for different reasons. 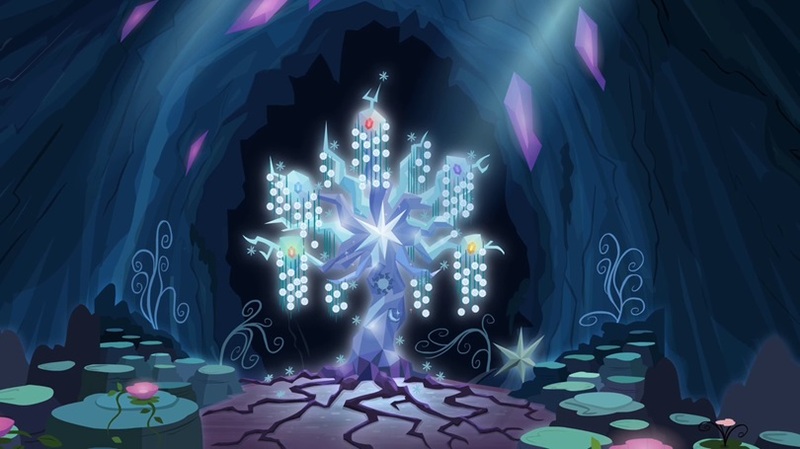 Despite being a jumping off point for angry young people to proclaim what they believe to be injustices made against a once admirable show, there were still plenty of reasonable fans who believed in the talent of the show’s production team, and that as long as they kept on making a good show, MLP would be just fine. Speaking for myself, this year holds a significant impact in the way I approach this series and media in general. Despite being a fan of the show since 2011, I always felt that I needed some kind of validation to justify why I watched it, which is why I felt so conflicted when I saw so many people which I use to admire for defending the show turning so violently on it since the beginning of Season 3 (or maybe also the end of Season 2). I was still enjoying the show, so for a moment I actually began to doubt the worth of my own opinions and preferences. I am not the most self-aggrandizing person around; even on the Internet I tend to be modest of what I am passionate about. So, it was genuinely exhausting for me to hear such joylessness and doom-calling regarding the show’s current state from people in a quasi-respectable position that I could hold up as evidence for why this show is worthwhile. After much pondering and self-internalizing (I know, I know), I concluded that I had to stop looking for others’ opinions to make myself feel good about what I like. It was time to be more confident in myself. If I liked something, I did not need to be agreed with and that’s all that mattered. I still had to learn to distinguish between the opinions of others that are worth my time and the ones that aren’t, but that’s a discussion for another day. Now, if I’m going to continue writing what I currently think about MLP as a whole, I should lay out some of my feelings regarding it, mostly so you know where I’m coming from. First of all, I don’t feel particularly aggravated by the absence of Lauren Faust. I believe that the show is still good quality (I’d even say it has improved in some respects since then) and the team led by Meghan McCarthy and Jayson Theissen has been doing a terrific job. Faust left behind a very solid foundation for others to work with, and so far, they’ve been using it to the best of their ability. I know some fans still want Faust to have some kind of influence, or at the very least, to have the current show-runners to think “What would Lauren do?” But, as far as I can tell, Faust left Hasbro on good terms with her co-workers and trusted that they would treat her creation with respect. After all, most of the people working on the show right now are part of the team she originally assembled. Now, you could say that without its auteur, it’s a lot easier for the corporate side of Hasbro to have its way with the show and bleed as much toys as they possibly can out of it, which leads me to my second major opinion: I don’t particularly care that FiM is used to sell toys. I may watch the show, but I don’t really care about the merchandise that comes from it. Mostly, this is due to my amount of disposable income, but even if I had money to spend on plushies, figurines, or whatever, I probably would only limit myself to a few particular items. It’s always seemed silly to me the way in which people get bent out of shape about the use of cartoons (or any other kind of media as entertainment) to sell a product, particularly when the main reason why that piece of media exists in the first place is because of the product it’s selling. 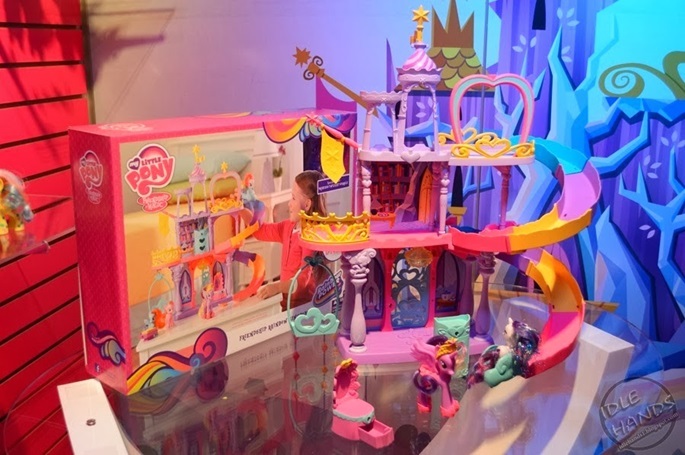 Make no mistake, FiM doesn’t exist because Hasbro wanted to get into making good TV exclusively, it’s because the company believed that they could still sell tiny plastic horses in a big way and this was a very good avenue to do so. In today’s toy market, the sales for toys aimed at boys are declining, while those aimed at girls keep rising. The market has been dominated for years by Mattel, with brands like Bratz and Monster High. After MLP was successfully rebooted and only kept getting bigger, it made sense (at least from a corporate standpoint) for Hasbro to use such a strong IP to develop something to face the competition. After all, when something becomes successful, you know that a company will try to make as much money from it as they can, not to mention that coming up with new toys for kids to buy is pretty much a necessity for one such as Hasbro. Seriously, if they decided to just sell the same toys every year, the company would´ve gone under decades ago. So far, while being a lot less subtle about what they’ve been selling, it feels that Hasbro understands that the fans of the show need to be kept happy (especially the younger audiences), and allow the series to still exist for its own sake, with the use of good characters and good stories to put them on. As long as the show doesn’t lose the heart and the characters that made it so popular in the first place, I don’t think we have anything to worry about. I bring this up because I want it to be known that while I acknowledge that at the end of the day corporations are still looking out for their own interests, it doesn’t mean that every decision associated with them has to be an evil one. So far, since Faust departed, I believe that Hasbro, DHX Media, and all involved in the production of FiM, have proven that they understand that a good quality show can, in fact, coexist with the brand’s marketability. Besides, if I were to single out MLP and its toy-pushing practices and not also condemn other brands such as Power Rangers, TMNT, etc. for engaging in similar practices, it feels like an empty accusation. Besides, if I’m not buying the merchandise anyway, why should I be worried? Anyway, let’s bring this back to Season 4. After the Season 3 ended with a game-changing event and Equestria Girls shook the foundation of the brony fandom, all were looking upon the arrival of new episodes, some with anticipation, others with dread. We all wanted to see where the show could go from where it left off, but those upset over the events of the previous year were waiting to see if the show could validate the decision of turning Twilight into a princess. So, right off the bat, the season premiere wastes no time in showing how Twilight has been adapting to her life as royalty. She feels uneasy about how the entirety of Equestria is expecting great things from her, and also how this new status could strain her relationship with her friends. 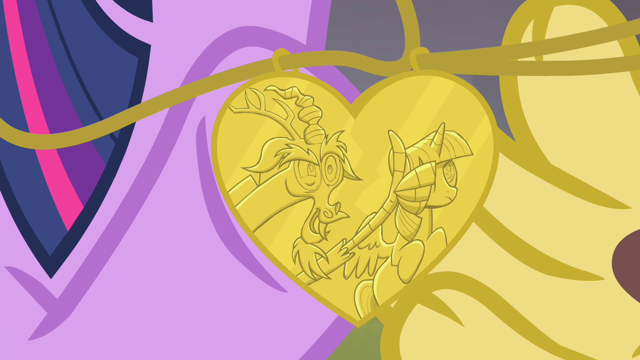 But, perhaps best of all, we also get to see how Twilight’s friends are reacting to this. They are very accepting of her promotion and, at one point, decide that they must take responsibility for her and help her fulfill her duties, even if it comes at the cost of having her stand in the sidelines while everyone else does all the work. But, in the end, they all learn that they need each other more than ever, reassuring the audience that the more things will change, the more they will stay the same. However, to the surprise of most of us, the episode ended with the introduction of an overarching plot, where the girls give up the Elements of Harmony to save the Tree of Harmony from where they came from. In return, the tree gives forth a box with six locks, setting the stage for an even bigger event. Besides the obvious implication, I feel that so much of the backlash towards Princess Twilight is because of how sudden it was. Aside from a few nods in the Season 3 premiere about Celestia having big plans for Twilight, the topic isn´t brought up again until the finale, and even then, the news were spoiled a few weeks before Magical Mystery Cure aired. 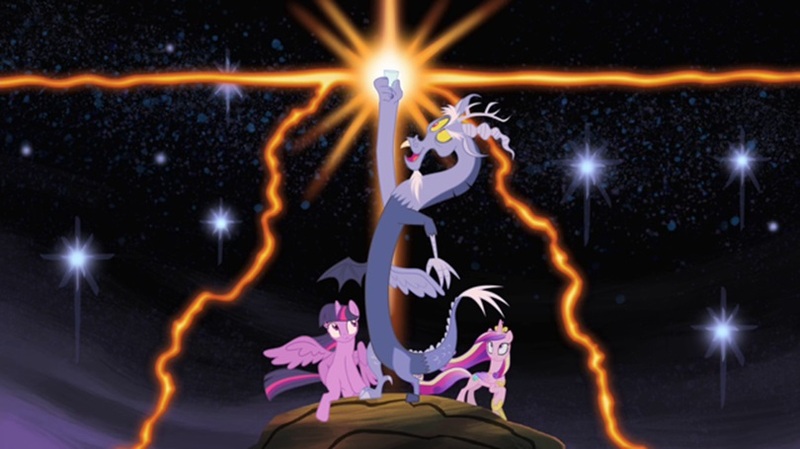 At the end of that episode, it was ambiguous just how much things would change for the series as a whole, but because of the show´s nature, it lets us know that Twilight and friends are all very happy about this and that everything was going to be fine, which means that whatever had to follow that, it would show us how things are actually NOT going to be fine. “Cure”, along with Princess Twilight Sparkle Pt. 1-2 created a mini-trilogy of sorts to set up Twilight’s journey into becoming a true princess. It’s all pretty standard, really. Part 1 is the optimistic first installment where Twilight’s promotion is a big celebration, Part 2 is the dark and more conflicting installment where Twilight faces a major threat to Equestria and is forced to act like a princess for everyone´s sake, and Part 3 brings us closure, at least for some of the most immediate questions regarding how is being a princess supposed to change Twilight’s life and her friends (as mentioned above). So, what comes after turning into a princess? After that, it would take a while before Twilight’s royal status would come into play again. While the topic is brought up again in Three’s a Crowd and Twilight Time, she remains unchanged. It’s not until the season finale where this is addressed. 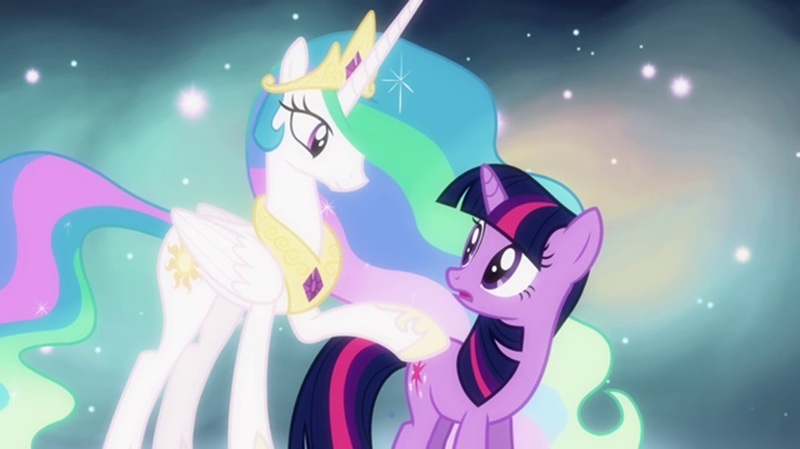 In a rather clever move, the crux of Twilight’s Kingdom’s story rests on Twilight feeling that despite being a princess, she doesn’t hold a major responsibility in Equestria like the other princesses. This adds a new dimension to what can be defined as a “princess” in this series. 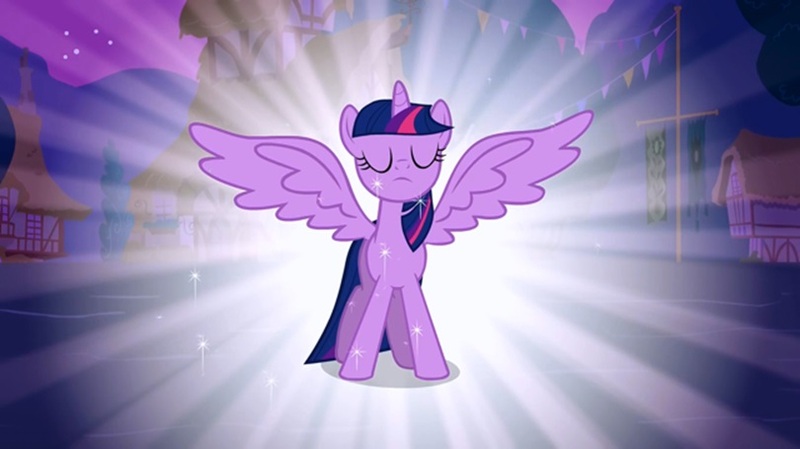 The reason Twilight got her wings was because she completed Starswirl the Bearded’s spell regarding the Elements of Harmony, proving that she had come to achieve a deep understanding of everything she had learned about friendship since she moved into Ponyville, thus turning herself into a true leader, worthy of guiding the other ponies of Equestria, someone who can inspire and guide others. At this point, Twilight’s progress is still rooted on her status as Celestia’s student. While it’s not very explicit (mostly because Celestia and Luna don’t get spotlighted all that much), Celestia saw great potential in Twilight and took her under her wing so she could live up to it someday. 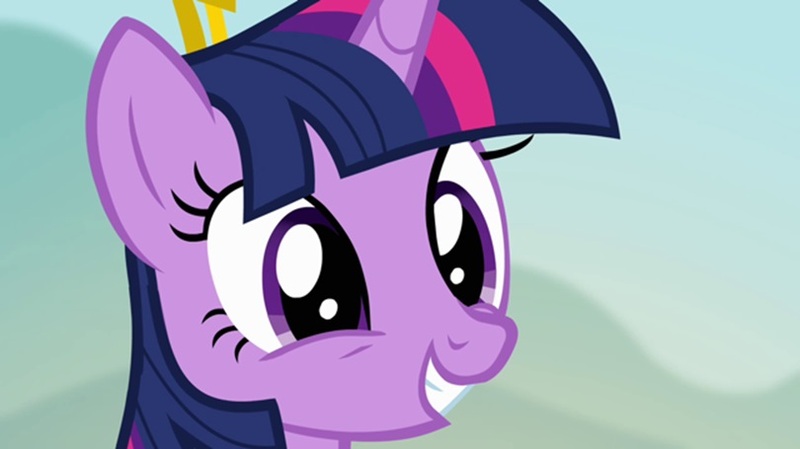 In this season’s finale, Twilight’s journey has expanded from a teacher-student relationship to that of her relationship to Equestria as a whole; she learns about how she’s meant to pass on what she and her friends have learnt from each other to all other ponies, at least that’s what the ending suggests. The road to this objective might’ve been frustrating for some, but I think this was a necessity. After all, having the series suddenly start revolving around Twilight´s life as a princess would be too big of a departure from the M.O. we´ve come to expect, especially so soon after her ascension. Besides, having the show change its focus to that would pretty much mean that Twilight’s friends’ relevance would´ve drastically changed for the worse (Basically, no matter what’s going on in their lives, it wouldn’t be as important as princess related business). Here’s where the mystery box story begins to show its true purpose: it allowed for Twilight’s friends to be involved in her quest, so that when the time finally came time for her to play her part as princess, they would be standing right next to her. Show of hands: Who knew what this was about right away? One of the more understated highlights of what some have come to call the “Rainbow Connection” episodes is that they were conceived to be their own stand-alone episodes in which Twilight’s friends can have a conflict that brings them to a hard decision between that which they are most passionate about in life and their former Element of Harmony (Wonderbolts and loyalty for Rainbow Dash, fashion and generosity for Rarity, etc.) while having a long-term impact on the mystery box story and Twilight’s quest, in the form of the keys/mementos that the girls received. Spanning a total of 9 episodes, this presents us a saga that, while imperfect, features some of the best character introspection the series has seen so far. Even some of the more problematic episodes have some of the best internal conflicts for their respective main characters, even when certain elements surrounding that core don’t live up to it. It was the best possible reassurance that Twilight’s friends still hold a huge influence on this new direction for the series. Even when Twilight officially becomes the Princess of Friendship, it is acknowledged that she needs her friends to stand by her. Hopefully, we’ll learn whether this gives them some kind of power position in the future. …and then there’s this guy. Speaking of huge influences, one of the biggest surprises of the entire season was the way in which the reformation of Discord paid off. Much like Twilight’s transformation, this plot point was introduced in Season 3 and would be used as the foundation for his eventual arc. His presence in episodes like Princess Twilight Sparkle and Three’s a Crowd allows us to see that he’s settling into a position as a sort of obnoxious would-be friend of the Mane 6. We needed to see this side of his character to understand that despite claiming to be reformed, he still didn’t have a grasp on true friendship (with the exception of Fluttershy). In a welcome surprise, and possibly the darkest turn of events in the entire series so far, Discord, after being allured with the promise of both friendship and the return of his former status as master of chaos from Lord Tirek, is forsaken and rendered completely helpless. After Twilight’s eventual sacrifice, it’s where he comes full circle and gives into friendship with no strings attached. What makes this so affecting is because it’s probably the most unexpected thing that could’ve been done with his character; having him come head-to-head with a new character that can one-up him as the most despicable and just plain ruthless villain in the show’s run so far, manipulating him (and also the viewer) into a false sense of security, only to pull the rug from under his feet. That being said, until we see to what degree this change will affect his presence in the show, we can then expect to get a better picture of what his new role will be until then. Overall, I don’t think I’m alone when I say that looking back on Season 3, it feels like a transitional period for the series, setting up some of the plot points mentioned above. Despite having some answers, we’ve yet to see how all these changes will affect the way Twilight and friends change the world around them. I like how the show is taking it’s time evolving, as opposed to just tossing a new status quo all together at us. In the end, it leaves me wanting more and giving a promising glimpse into the future. It works as its own story, yet it feels like part of something bigger. Sure, a lot of these changes are dictated by whatever new toy Hasbro wants to push, but I’ve already made my point for why I think that doesn’t matter. So yeah, pretty damn good job. I’m expecting this thing to get pretty wordy, so I’m gonna have to stop here and continue in another editorial. Next time, writing, music and action! This entry was posted in Technicolor and tagged equestria girls, fim, friendship is magic, Hasbro, mlp, my little pony, season 4, twilight sparkle on June 21, 2014 by ArthurCrane. I’ll admit, after I found out Season 3 would end with TS becoming an alicorn, I jumped on the bandwagon and said “This is stupid, this is a bad move.” I should’ve waited for context, because not only did the change itself work, the consequences worked as well. I was wrong to judge so quickly, and I’m very glad I wasn’t vocal about it, because it truly was a good move on their part. 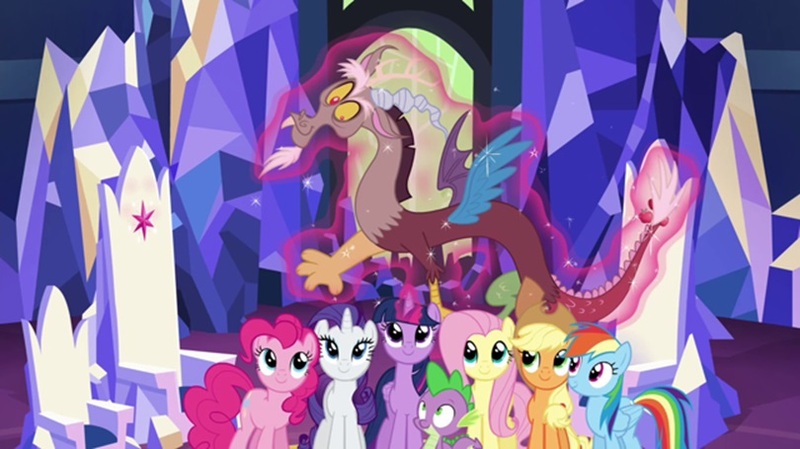 I will say, however, that I feel Discord’s arc could’ve been handled better. The shift between the character we see in Princess Twilight and Twilight’s Kingdom was very jarring, and needed more time to develop. I can understand that bringing in a guest actor like that for multiple episodes can be expensive, but it seems like John de Lancie probably would’ve been willing to negotiate something. 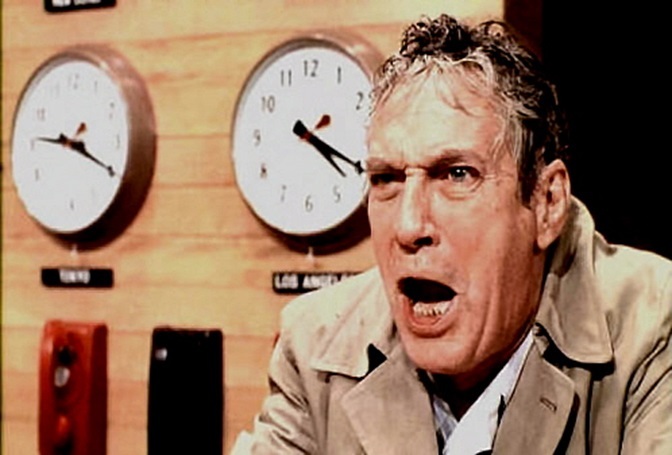 Plus, more episodes with Discord development would’ve replaced some of the more superfluous episodes, like ‘Trade Ya!’ The only possible downside would’ve been the cost of those episodes. Thank you for your feedback. Lots of valid points overal..